W9RPM has reached the pinnacle! He's worked 'em all! The plaque award is in progress and will be presented in late Oct or early Nov. He's had lots of VHF activity via the WIVUCH program--you can too! 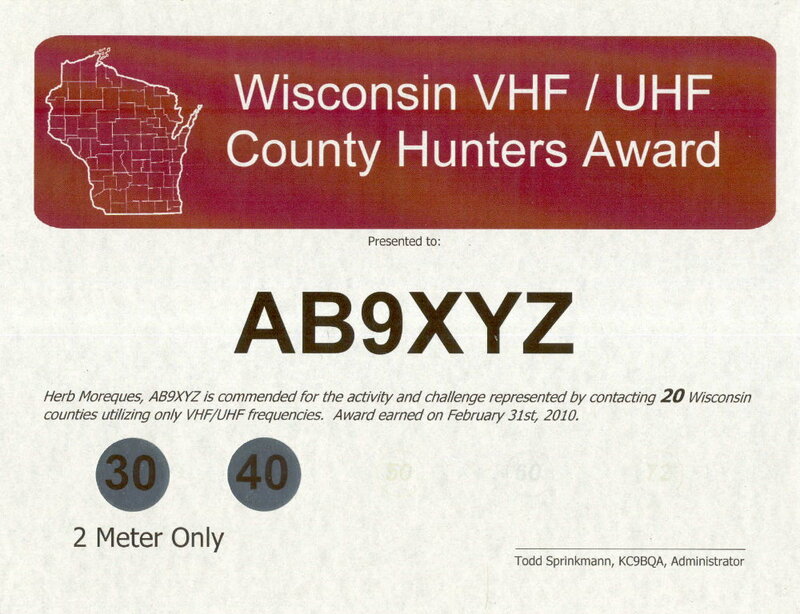 John, says that he will continue to stress "county hunting" in his VHF activity. WIVUCH Logos for your webpage or QSL card have been added on the "Maps and Forms" page. Put 'em to use! Check out the http://kc9bqa.com website and review the postings for the past two weeks. W9FZ activates Burnett, Washburn, and Sawyer on Sunday, July 24th 2011 from 7pm to 10pm local. CQ'ing on 144.190. Check the ON4KST chat page. More roves coming up in mid-Aug. W9GA/R is planning a rove in south-central Wisconsin! Chippewa Valley VHF Contesters--if you're in northwestern Wisconsin join with these guys.